1. In a medium saucepan, combine the whole milk with the heavy cream and bring to a simmer over moderately high heat. 2. In a small bowl, beat the egg yolks until combined. Slowly whisk in 1/2 cup of the hot milk, then transfer the mixture to the saucepan. Cook the custard over moderate heat, whisking constantly, until it is slightly thickened, about 2 minutes. Immediately add the finely chopped Mexican and bittersweet chocolate and remove the saucepan from the heat. Stir until the chocolate is completely melted, then strain the mixture through a fine sieve into a large glass measuring cup or bowl. Pour the chocolate mixture into 6 small bowls and refrigerate until the pots de crème are chilled, at least 6 hours or overnight. 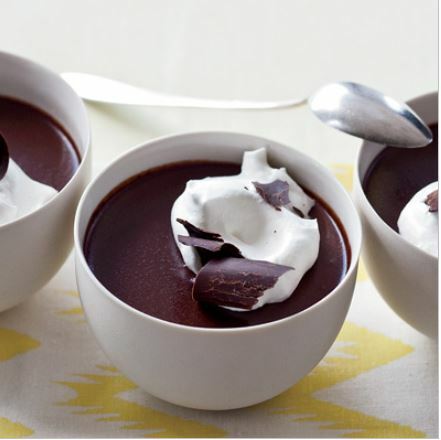 Serve the pots de crème with unsweetened whipped cream and chocolate shavings.